Expecting everyone in the file d’attente behind me to be groaning at my idiocy in not being prepared to pay, I dug out my wallet and started digging through it frantically. “Relax, it’s Sunday,” said the nice lady behind the counter. The basic principle of shopping in a marché (market) is this: look for the longest line, and get in that one. If there are lots of little old ladies in it: all the better. So, it’s my turn at the chosen fromagier’s kiosk, and madame is weighing my little Vacherin. Because there are tons of people in line behind me, I’ve got my money right there in my hand, waiting to pay as soon as I have the goods in hand. Seulement voilà (the thing is), when the fromagière tells me the price, it turns out to be twice what I thought I remembered from last year. Expecting everyone in the file d’attente behind me to be groaning at my idiocy in not being prepared to pay, I dug out my wallet and started digging through it frantically. Relax, it’s Sunday, said the nice lady behind the counter. (If it’s in italics, in happened in French. But, this gentleman in line behind me, this lady–I don’t want to inconvenience them. Oh, no–madame is right, it’s Sunday. No one is in a hurry, said the gentleman. He smiled. The lady behind him smiled. The fromagière smiled. I even smiled. I got my Vacherin, said au revoir to everyone, and walked away. Have a good Sunday, said the fromagière. Explain to me again why you think that French people are rude?? Also known as Mont d’or, I think it’s hyper-bon, and apparently a lot of other people do, too, because at this time of year, it’s stocked more heavily than anything else. As you can see in the photo (taken on my kitchen table), it comes in a box (and it must come in a box), and the box is made of épicéa (spruce) (and it must be made of épicéa). Cantin says that it’s from the spruce that the unusual taste of a Vacherin comes. In the time that it’s taken me to write this post, I’ve eaten approximately 25% of my Vacherin, and you know what? I don’t care. The other day I calculated how many more weekends I have to live: 680. Probably sounds morbid, but it inspired me to work not more than, say, 30 minutes all of this weekend, which happens, like, never–did you calculate how many weekends you have left yesterday, and if not, what did you do this weekend? Carpe diem, baby! le vacher : cowherd. Le vacherin était autrefois le fromage des vachers. As Cantin explains this: back in the days, comte was made in the mountains while the cows did their summer grazing. In the winter, the cows would be back in the stables, and the milk quantity and quality decreased. Additionally, the roads could impassable. So, rather than taking the milk to a cheese-maker, the farmers made their own cheese out of it–hence Vacherin being a vacher’s cheese. boughten: yes, boughten is English. More commonly, it’s bought, but you will run into the boughten form in some dialects–the Midwest and the Northeast, mostly, I think, although I couldn’t swear to that. There are rules to cheese-cutting. Strict rules. Strict, strict rules. If you’re a native speaker of American English, you probably giggled childishly at the title of this post–I will admit that I did while watching the video that inspired it. I’ll explain why in the English notes below. It’s no secret that food is a huge part of French culture, and it’s no secret that cheese is a huge part of French food. 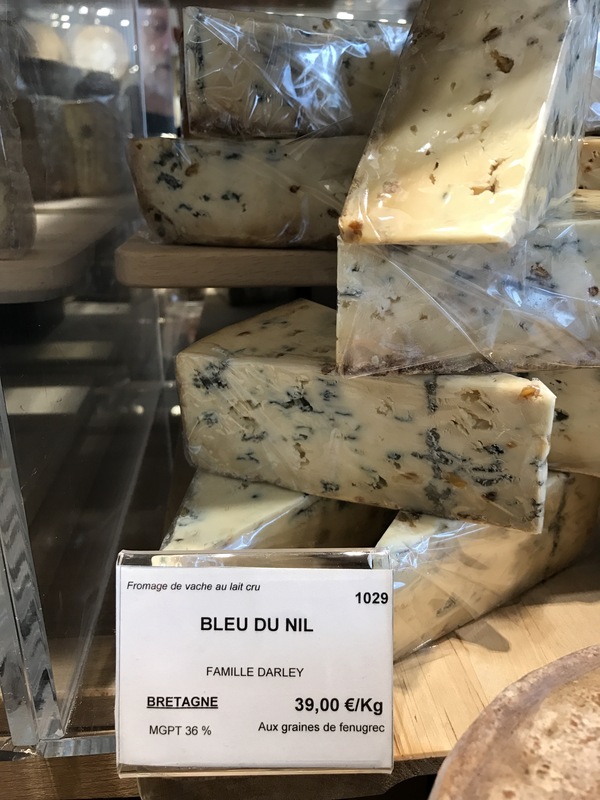 You will often read that “the cheese course”–the traditional end of a French meal–is disappearing from French tables, but I can tell you this: I have never had a dinner in a French home that didn’t have one. Rather than being the absolute end of the meal, it might be followed by the optional French fruit course, or it might be followed by a sweet, American-style dessert–and it’s certainly the case that I have no reason whatsoever to think that the small number of meals that I’ve had in French homes were in any way typical. But, for my sample, it remains the case that the cheese course lives. I go back and forth between France and the US pretty frequently–three times in the past month (excessive even for me). The hardest thing about adjusting? Table manners. No sooner do I get used to keeping both hands on the table while I eat (obligatory in France–to do otherwise would be low class) than I find myself back in the US, where I must have one and only one hand on the table while I eat (to do otherwise would be low class). I’m well aware that there are a bazillion other aspects to good table manners in France–and well aware that I have no clue what they are. So, I was happy to see that the always-adorable Géraldine of the Comme une française YouTube series has just put out a video on the subject. …il faut veiller à ce que chacun des convives puisse disposer d’une part allant de la croûte au coeur. le convive : this is a guest, but from what I understand, it is specifically a guest who has been invited for a meal. So, this wouldn’t apply to, say, someone coming to spend a week with you. veiller à ce que + subjonctif : I think this means something like to make sure that. la croûte : the rind of the cheese. You probably already knew this one, but I try not to miss a chance to write a circumflex accent. le coeur : this is the center of the cheese. There are actually a number of different kinds of cheese knives. I think that they’re destined for cheeses of different degrees of softness/firmness, but I haven’t yet found a good source for information about these. Anyone have suggestions? This nice graphic comes from a page that waxes quite eloquent about why it just doesn’t make sense to cut a roquefort any other way than this. A nice additional point of vocabulary: le talon (heel) for the end of the slice that’s away from the center. Now, here’s someone who’s OK with you cutting the point off of a brie. But, notice: You’re not just cutting the point off–you’re cutting it at an angle, such that the other slices, mostly fan-shaped, will get well towards the center. Why would this be OK? Probably because bries in France are big. What is sold as a brie in the United States is actually about the size of a camembert in France. In contrast, bries are considerably larger here. While a camembert is about the size for one meal if there are a few people eating, a brie is a big family-sized thing. You would get quite a few meals out of one, or even out of a good-sized slice of one, if your family isn’t huge. So, what’s so funny about Géraldine’s delightful video? At one point, she makes reference to cutting the cheese. In English (American, at any rate), to cut the cheese is slang for to fart. To cut a cheese doesn’t mean that at all–it means that there’s a cheese, and you’re going to cut it. To cut the cheese: to fart. Clear? So, yes–it’s childish, but native speakers probably giggled at the title of this post. Here are some more examples, mostly referring to Trump. @AynRandPaulRyan @FLOURNOYFarrell @realDonaldTrump @marchfeed Brandishing a look of holy sh*t, who cut the cheese,Fonzi. Half of a Munster. Photo source: me. My Saturday morning shopping trip always starts with a visit to the neighborhood cheese shop. Once I get there, I check the sign in the window to see what’s in season. If it’s not something that I haven’t tried before, I go in and shop for something interesting. Every French cheese has its story–and its particularities. Munster is thought to be one of the oldest cheeses in the country. I’ve seen estimates of its date of origin from the 700s to the 800s. The story is that it had its origin in the village of Munster, currently located near the very easternmost part of France, quite close to Germany. The village is thought to have taken its name from the Latin word monasterium, meaning a monastery or a monk’s cell in Medieval Latin. People clustered around the monastery, and in order to ensure the availability of food to the surrounding populace, the monks made this cheese. (I’m a little skeptical–like any other soft cheese, Munster doesn’t last very long.) Another story is that the cheese was brought into the region by monks who came to Christianize the area during the time of Charlemagne. In the 1500s, it became popular outside of the region, being sold not just in Paris, but in Luxembourg, Switzerland, and Germany as well. Back in those days, the price of the cheese for the upcoming year was announced every June 23rd at a large fair in the town of Gérardmer–I’ve never heard anything similar about any other cheese. Some cheeses are defined in part by what the cows have to be fed in order for a cheese to have the right to its name, and Munster is one of those. The cows have to graze on the grass of the massif of the Vosges, in eastern France. This is what gives the cheese its terroir, its regional character. During its preparation, the surface of the cheese is salted, and you can taste that very clearly. While it ages, it is occasionally washed with beer. This kind of washing is characteristic of cheeses that originated in monasteries, and specific cheeses have to be washed with specific things. If it’s not washed with beer, it’s not Munster. Munster (pronounced, incidentally, [mœ̃stɛʁ]]) smells stronger than it tastes, so it’s actually not a bad cheese for an American who is just starting to explore the stinky cheeses (even the French call them les fromages qui pue, “cheeses that stink”). Enjoy! Camembert is sold in wooden boxes. 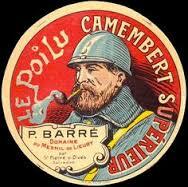 Here is one with a picture of a poilu, or French soldier from World War I, on the lid. Every French cheese has a story. The story of camembert is that it was created by one Marie Harel when a priest fleeing to England around 1790 gave her some suggestions based on how they made cheese back in his home in Brie. (The Church was gone after with a vengeance after the French Revolution. Over 200 priests were killed in the September Massacres in Paris in 1792. I went to a beautiful Vivaldi concert nearby.) According to Kathe Lison’s delightful The Whole Fromage: Adventures in the Delectable World of French Cheese, camembert makers distributed it for free to soldiers in the trenches during World War I, hoping to create loyalty, and it worked. puisque: since, because, seeing as; just as, just like. The traditional French store is a little mom-and-pop operation. A French neighborhood will have a boulangerie, where you get your bread; a patisserie, where you buy your pastries; a fromagerie, for cheese; a fruit and vegetable stand; a wine shop; a butcher…you get the idea. Parisian kitchens are pretty small, without much storage space, so you go grocery-shopping pretty frequently, and make lots of small purchases at the local shops. As in most places, the supermarket appeared quite a while ago in France. In Paris, it’s most often a Monoprix. You can find pretty much everything you need there, and not just food, but clothes, school supplies, on and on. I go to the Monoprix once or twice a week, as there are a few things that I don’t know where else to buy–the giant 0.78 kilo jars of Nutella, for instance, or giant jars of cassoulet. It’s convenient in terms of having everything under one roof, but: it is a miserable experience. Shopping in a Parisian supermarket is a blood sport: you stand in line at the deli counter (if that’s the right word for the part of the store where you buy deli meats, but also grilled cuttlefish, duck Spam, blood sausages…and let’s agree to forget the time that I almost found myself in the middle of a fight in the deli line, when I suddenly realized that the British tourist for whom I was mindlessly translating was deliberately egging on a pissed-off French family man), you shuffle with hordes of other people through the coffee aisle, and finally…endless, endless lines for the cash register. I now know why Parisians always look so glum–they’re exhausted from standing in line at the Monoprix. There’s a way out of the hell of supermarket checkout lines: shop at the little mom-and-pop specialty stores that dot your neighborhood. Go to my little fruit and vegetable stand across the street, where the seller will ask you when you’re going to eat his produce and then give you an assortment of more- and less-ripe things meant to last until you come visit her again. (Sorry for the gender confusion–they’re a couple, and I’m too scatter-brained from sleep deprivation to fix this.) Walk to the next subway stop to go to the cheese shop, where you can ask for a recommendation of a seasonal cheese and be offered a taste of something in season from a guy who actually does know what cheeses are in season. Go to the little bakery on the corner, where the lady at the counter will very kindly correct your pronunciation of champêtre at no extra charge. As soon as I figure out where else to buy giant things of Nutella and cassoulet-in-a-jar, I’ll be done with Monoprix for good.